I carry a wide array of instruments and bows for professional, amateur and student players…from full size violins down to 1/8th size as well as all sizes of violas and cellos. Check the individual listings for Violins, Violas, and Cellos in their own sections of my website for a more complete listing. Check individual categories for more detailed descriptions of instruments and bows. Children's sizes, from 1/32 size up to full size. Looking for a 3/4 size violin? 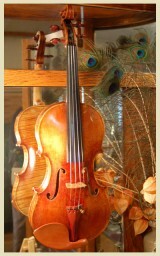 I currently have 36 3/4 size violins available, along with cases and bows! Melanson, Raymond, Boston- 1986, Guarneri model. Frederick Ewald Haenel 1939. Made for The Rudolph Wurlitzer company. Stradivari model. Rossow, Steve, Saint Paul, Mn. 2012. Monnig, Fritz, ca. 1920-1930, Markneukirchen, Germany. Fritz Monnig was born in 1890 in Markneukirchen, and worked in Hamburg, and Berlin before earning his masters degree in 1913. He is a highly regarded maker. Mathias Dahl violin- Minneapolis-1953 Guarneri model, two piece back. Great condition. These two violas were built by Dahl on his own model. The viola he made in 1951 is pictured in the book "Violin and Bow Makers of Minnesota" a publication of the Schubert Club Museum. A viola showing inspiration from the Brescian influence (Giovanni Paolo Maggini, and Gaspar Da Salo). The viola has a beautiful one piece maple back, with matching sides, neck, and scroll. A viola by Peter Yang of Chicago. A fine viola by Edwin Halloran, Chicago. 15 7/8". Edwin has a knack for making a comfortable to play viola with a great sound. Scott, William Robert - Viola, 16 3/8". Made in Minneapolis in 1999. A fine example of Bill's work. I have many more 16" violas. I just haven't listed them. I will add more as I have time. Full size violin bows by such makers as, Roger Zabinski, Lee Guthrie, Matthew Wehling, David Forbes, Manoel Francisco, Joseph Halligan, Martin Beilke, Arcos Brasil, Alfred Knoll, J. P. Gabriel, Horst John, Marco Raposo, Erich Steiner, Alfred Knoll, and many others. My inventory of older bows includes bows by many different makers including, Francois Nicholas Voirin,Louis Morizot, Martin Beilke, Silvestre and Maucatel, W.E.Hill &Sons, and many more. Pio Montanari- Guarneri model violin made in Genoa. This is a new violin and has not been antiqued. The price is $16.000.00. Comes with a certificate from the maker. A fine Italian cello from the workshop of Ettore Soffritti, in Ferrara. This professional level cello was played for many years by the same person, and is only recently for sale. Christopher Dungey, made in Boulder, Colorado in 1996. Zumberge, Scott, Minneapolis, 1982. The sound of this cello is warm and full. Mathias Dahl, Minneapolis, 1965- "The Dahl Stradivarius". Phillip Soltis, Northfield, Mn. 2014. Clemente & Weise, Bubenreuth, Germany, 2004. Instruments and bows are available in most price ranges. if you don't see what you are interested in listed, please call or send me a message. I may have what you need.